Sunbelt Shutters offers classic hardware for your custom exterior shutters. Our shutter strap hinges are solid, sturdy steel with a black powder coat for long term functionally and appearance. Our hinges are perfect for giving your home's shutters a classic look in a variety of lengths. Solid cast iron, Clark’s Tip type surface mounting hinges are designed to mount shutters flush with the outside of your home's windows. 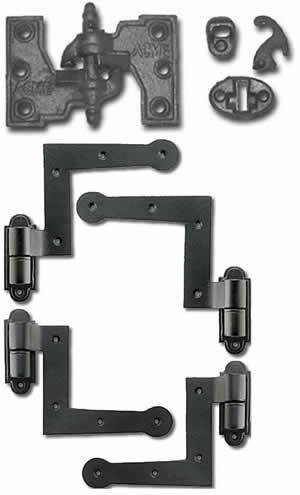 Clark's Tip hinges are sold as a kit for one window and include fasteners. Solid cast iron Acme, Lull & Porter type hinges for home's window shutters. Acme, Lull & Porter hinges are mortised into the edge of the shutter. 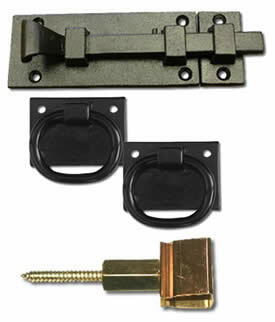 These hinges are sold in a complete set for one window, including fasteners for holding the your shutter's closed. Shutter tie-backs, or "shutter dogs" as they are sometimes called, are used to keep shutters in their open position and firmly against the house. Shutter dogs serve a functional purpose and also offer the opportunity to add a unique architectural appeal to your home - all the while complementing your shutters. Lag mount Tie Backs are the most popular shutter tie back mounting option. Lag mount tie backs are used on stone, stucco, brick, and frame construction. Surface Mount Tie Backs are only used on frame construction buildings. The surface mount tie backs include all the hardware needed for mounting directly to your wood siding. Sill Mount Tie Backs used with stone construction and other siding and finishes where the lag mount or surface mount tie backs cannot be securely mounted. The sill mount tie backs are also an excellent accent feature for your shutters. 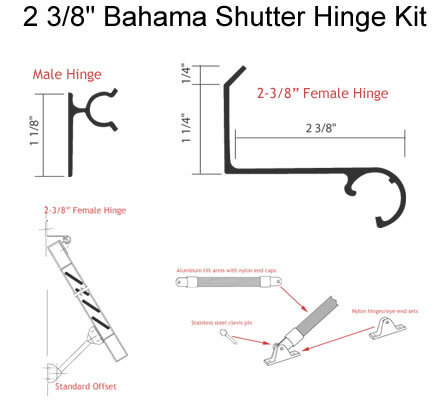 Our bahama shutter hinges are available in 3 profiles: the 2 3/8" is a surface mount to support a 1 1/2" thick shutter, the 3 1/8" surface mount hinge projects the shutter an extra 3/4" from the building, and the 3 3/8" hinge is for recessed openings. The hinges are custom cut to the width of the shutter. The aluminum telescoping bahama shutter arms are sturdy and are adjustable for the desired shutter opening angle. Our shutter slide bolt and lock keeps the installed shutters secure in the closed position. The slide bolt and lock are constructed of heavy duty steel and are powder coated black. The slide bolt and lock are offered in a different lengths from 6 to 12 inches. The slide bolt and lock are sold as a set. A set contains a slide bolt and a lock. We offer 2 types of pull rings. These rings make it easy for you to close your functional custom shutters. Our rings are wrought steel shutter ring pulls with square mounting plates. This ring pull is made in the USA of wrought steel, which is galvanized and powder coated black. Acorn Bullet catch is a convenient and secure spring action shutter holdback. Acorn Anchors secure the shutter to home's side and keeps the shutter open. These are not visible from the front of the shutters. Bullet portion of catch is threaded to fit a 1/4 x 20 machine screw or hanger bolt.